I am happy to welcome you here on the occasion of the fourth centenary of the foundation of this association of the faithful consecrated to the worship of our Mother. I greet Archbishop Enrique Benavent, Bishop of Tortosa, and Mrs. Meritxell Roigé, Mayor of the city, who accompany you on this pilgrimage. The confraternity of Our Lady of the Ribbon has been since its inception linked to the successor of Peter. A few months after the formation of the brotherhood, approved by the bishop of that city, Luis de Tena, they wanted it to be confirmed by Pope Paul V. And now, with this pilgrimage to the tomb of Peter, they wish to renew that bond of communion . This gesture of adhesion is not something of the past that arouses only a mere historical interest, but keeps its relevance alive. You call yourselves brothers, brothers, and in that way you reveal the fundamental reality of our lives, that we are all children of God. Etymologically, brotherhood means "union of brothers". But it is not enough to say that we are brothers, but we must always remember that "foundational" unity that marks us as such. The brothers-we know-often argue, and fight over so many things, but even when that happens, they know how to keep alive that search for a good that can not exclude peace and harmony between them. And when they fail to do so, they suffer. 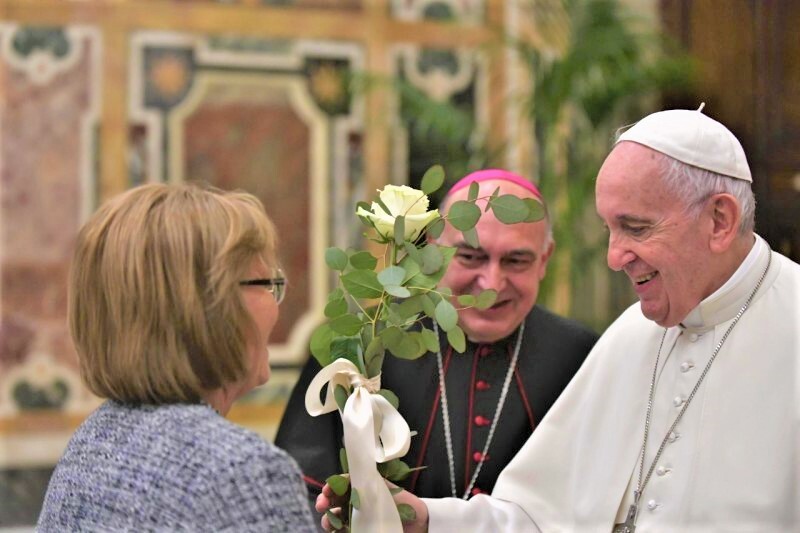 The bond of charity that as brothers unites them with their Bishop and, through him, with the Pope, constitutes an important gift that enriches them but also entails a mission: to be a ferment of solidarity in society. Looking at the example of Mary, we are called to bring that fraternity to all corners of society. You are present in different ecclesial realities in your diocese, in this way they collaborate so that the Church is first of all a house, a family, a place of welcome and love, in which everyone, especially the poor and marginalized, can feel a part and never see themselves Excluded or rejected. Living in this way fraternity becomes a mission, which challenges and does not leave indifferent, because the mutual love that goes out and is directed towards others is our letter of presentation. Thus, even those who have no faith can say that eulogy of Tertullian: "Look how they love each other" (Apologeticum, 39: PL I, 471). Living in this way, as united brothers, means effort and resignation, but I assure you that it is worth it, because it is a sign before society that is always divided, it is not fashionable now, it was always and it is a social sin to divide us. That is why every manifestation of brotherhood, of solidarity helps. I encourage you in your task to be a sign before the world of that fraternity that comes from God. May the Lord bless and sustain you always, and may the Holy Virgin take care of you and accompany you in this work of consolidating the fraternity.